Hurrah! Donut Parade's classic treats are back. It's less than a half-hour from closing, but still a steady stream of customers parade through the front door of an iconic East Spokane donut shop to sate their appetites for something sweet. Donuts in the pastry case this late in the day have recently been a rarity. "The community response has been amazing — overwhelming in a good way," says Nathan Peabody, who owns the shop with wife Christa. "We ran out of donuts for the first 10 days of business even though we kept making more and more and more." The locally beloved Donut Parade, first founded in 1968 by Darrell and Kathy Jones, closed to much disappointment in December 2016 when the shop's second owners, the Reno family, at the time blamed slow sales compounded by a car accident that badly damaged its front entrance. The Peabodys began pursuing plans to reopen the shop shortly after, eventually signing a lease and beginning renovations last December. One of their main goals in reviving the business is to create an opportunity for local youth to gain job skills and workplace experience. On the day of Donut Parade's highly anticipated official reopening on March 13, a line of eager customers wrapped around the building and down the block. That day's supply of donuts was gone within 45 minutes. "It seems like every other person has a story about this place," notes Christa Peabody. "It's very unusual to get 'thank you' for opening a business, but a lot of people say that. That has been the most surprising thing to us, but it seems to mean a lot to a lot of people." The Peabodys were able to connect with the family of Donut Parade's late founder Darrell Jones, learning about the shop's history and what they could about the original owner's recipes, which weren't recorded but that the couple has tried to replicate as best they can. "Now on top of our original goal of having a place for youth to learn job skills is to try and keep it true to what it has always been," Nathan says. Those familiar with the shop's past iterations should notice the Peabodys' improvements to the space, including new paint, flooring and restroom overhauls, but also their commitment to keep some of the shop's original fixtures. The display cases and a bartop with stools remain, as do the vinyl-covered booths. They've also left intact an old, faded window painting of two cartoon donuts skipping hand-in-hand on the front window, but added a new mural on the inside wall near the door by local artist Chris Bovey. The donuts themselves are a pared-down collection of classics: old fashioneds, maple bars, cake donuts, apple fritters, cream and jelly-filled donuts, chocolate flavored, plain glazed, powdered sugared, and versions topped with frosting and sprinkles. Individually priced between $1 and $2.50, donuts can, of course, also be ordered by the dozen, either in a pre-assorted box ($12) or by customers' choice; the latter option is priced individually by donut with a 15 percent discount on the total. A dozen maple bars are $15. Beverage choices are drip coffee from nearby Arctos Coffee & Roasting Co., tea, milk and juice. The Peabodys hope to add lunch items in the future, starting with simple fare like hotdogs, chili dogs and bagel sandwiches. Daily specials are also starting to appear on the menu, like the Sloppy Dez ($3.50), a buttermilk donut topped with warm sausage gravy. On a recent Wednesday after the shop has closed for the day, plenty of donuts remain, though not for long. A volunteer stops by to pick up some of these leftovers to drop off at Spokane fire stations, and maybe also at the Spokane Police Department. Other days, the Peabodys are donating the leftovers to various local nonprofits that feed people, Nathan notes. 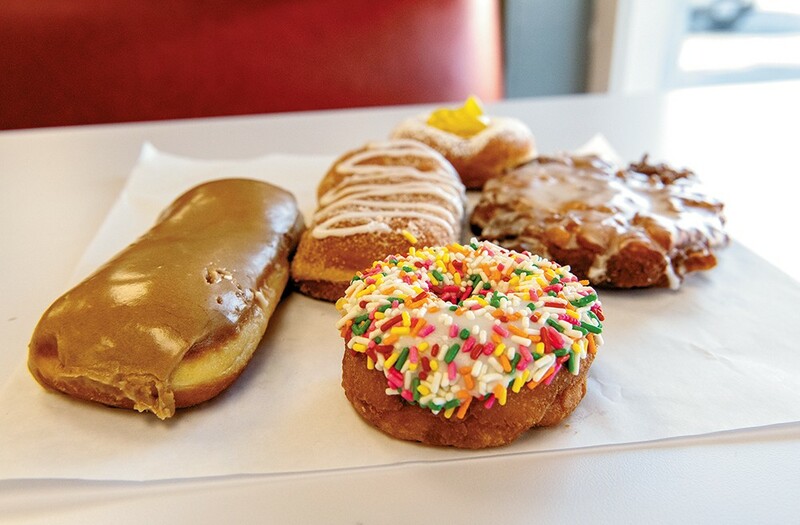 To help meet demand for specific donut varieties on a given day, Donut Parade recently started accepting preorders, allowing customers to place orders the night before for pickup the following day. Preorders can be made by phone, in person or through the shop's Facebook page. The original print version of this article was headlined "Sweet Strides"